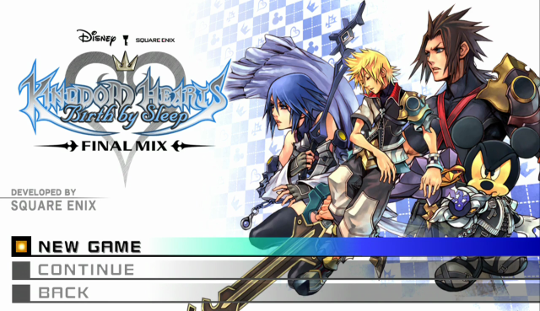 My look back at the Kingdom Hearts series continues into Birth by Sleep! The Kingdom Hearts Retrospective updates Tuesdays and Saturdays. If you want to get started with the original KH1 retrospective, check out the Introduction or the KH1 Retrospective's first post! Very excited to see you're still trucking along! Big fan of your work so far on this, and I've been reading your blog along the way as I replay all of KH, it's been a real treat. (I'm currently only towards the end of KH2, and am thus there on your blog, and since I already replayed Days in this marathon of mine a ways back, I'll read through that as soon as I get done with KH2). Btw, not that it matters much, but I am the commenter that goes by Seraphiel on your blog. Can't wait to read more! I think you need to change that. Really excited and I definitely will be reading through all of your posts while being on the bus and I'll also post my thoughts! Can't wait to see what you think about BBS. Not sure if this part was directed at me, but in case it was, oh trust me, I haven't skipped out on Days. I just started a KH marthon of trying to 100% each one from start to finish in order of release, starting with KH for PS2. Thing is, I got started a good while before 1.5 was released (it's been going for a while, hahah). So I've resolved to add in the PS3/4 remakes to said marathon, and as such have definitely played Days and watched the movie in this marathon, I'm just currently at KH2FM on 2.5. Unless that was directed at Blackdrazon, in which case, their retrospective does cover Days, doesn't it? I haven't gotten to it, but I thought I saw it being posted. Well, this retrospective is about BBS, not Days. I think he copy-pasted the original and forgot to edit the Days part out, ao I just wanted to point that out. Wow! Havw fun with your marathon. Ohhhh my mistake, I didn't realize you were quoting him! Sorry! And thanks kindly! I sure am. Blackdrazon's retrospective here has been one of a few motivating forces to keep going with it, so I can read along! Some insightful stuff there, really made me think, especially about KH2's weird development and seemingly cobbled pieces. Curious to see if he'll have anything similar to say about BbS, since I know that had some weird changes along the way that left some plot ideas seeming a little fractured. Hm, interesting. Started reading a bit, guess I might follow this along. (I really like the minimalistic design of the blog btw). I really loved the first two posts! Also, very interesting playing order. Keep up the good work! Thanks to all for the comments and good luck to Vaddix on the playthrough! Keep me informed! Good first two entries. I laughed at the obvious symbolism joke about the name of Land of Departure. Nice one. I am so glad you went with Ventus first, I have been a VERY big advocate ever since I experienced the story that Ven should be played first. I swear Ven was intended to be the first character originally why else start the game as Ven in the first place? It's just more natural to start and continue as Ven than it is to start as Ven and suddenly jump to Terra..and a little less unnatural to jump to Aqua since they are closer in playstyle. Then again I also swear that Ven and Aqua's stories in certain worlds were swapped because Aqua's story doesn't line up at all with the big moment in RG, nor does Ven's really, and honestly neither does Terra's reaction which almost leads me to think that the big twist spoiling in Terra's story was something that got added in later and was not part of the original draft. It's not AWTD shattering Ven's heart station it's actually soul eater, you also left the most important detail. Ven doesn't just become a shooting star he becomes a shooting star that very specifically zooms/vanishes into Sora. Oh and that whole heart station thing is a big error, in the PSP version Ven's heart station has like this white star looking symbol crossing across all the people circles. For whatever reason in the HD remake they made the mistake of using Ven's endgame heart station instead....for a game that was basically just ported (not even properly HD they just are rendering everything at its native size) it was a very weird error to make. Almost as weird as...not just porting Roxas's battle quotes and instead porting Ven's battle quotes into the Roxas segment of KH2FM+ which sound so jarring because Roxas doesn't speak with such a high energetic voice. I don't think Aqua knows why she lied either since this is something never again addressed and I'd say this falls back to hints of the plot being re-written pretty heavily...well that and the fact we go from a steady stream of news, to a stupidly long dead spout, and next time we get news the japanese spelling of the unbirths had very clearly changed to unversed. Most likely all the rewriting had to do with them no longer planning to have BBS address the idea of "the life of a heart before birth" that unversed (or unbirths if you will) would of tied into. Also Terra and Aqua met Ven 4 years ago minimum, BBS is just lazy and never made models to show the change in age probably because they already knew they would never again be used though to Jason's credit he DOES try to sound a bit younger. But honestly I chalk it up to laziness given they also made a million excuses to justify why they wouldn't age not just in BBS but in 0.2 as well. Oh and Aqua and Terra haven't actually been training for their mark of mastery exam, Eraqus was never going to give them an exam he was just going to name them masters when the time was right. It's up the master if they take an exam and what exam they will take, however Xehanort stuck his big nose into things. After being invited to see their christening as masters Xehanort basically gets Eraqus to decide that they should prove themselves through a test first, the old traditional test that has been used in the past. Hence Aqua's comment on the mark of mastery as if she just remembered it makes pretty good sense. Honestly it would have been so much better if they had started us a few days earlier and let us get to know TAV over a course of days and actually SEE things like how Terra and Aqua reacted to being told "I know you were going to be named masters but before doing so I've decided now to give you an ancient style mark of mastery test". Of course BBS is basically anti-fleshing out TAV's history, friendship, and establishing their normal lives because it wants to skip all that and jump right to the breaking. Which hurts the plot so hard, I swear it be like if you turned on KH1 and started right at the sunset scene with Sora, Riku, and Kairi talking and then jumped to the night of the island being destroyed. Which actually now that I think about it WOULD work if cut properly but it would of damaged KH1's plot to hell and back by doing so. Anyway enjoyable as ever keep up the good work. I don't think Aqua knows why she lied either since this is something never again addressed and I'd say this falls back to hints of the plot being re-written pretty heavily...well that and the fact we go from a steady stream of news, to a stupidly long dead spout, and next time we get news the japanese spelling of the unbirths had very clearly changed to unversed. Most likely all the rewriting had to do with them no longer planning to have BBS address the idea of "the life of a heart before birth" that unversed (or unbirths if you will) would of tied into. I am so glad someone else remembers this. I always had a vague memory of these details from the BbS news cycle but always had difficulty digging up this info. I've mentioned this to others who usually keep up with KH news in the past and got some weird looks for this, for some reason this beta-sorta info slipped through the cracks for a lot of people. Much like KH2's heavily butchered and Frankenstein'd plot, I'd really like to look deeper into whatever the heck BbS was "meant" to be, to see what the earlier vision was and see if it could somehow fit in with the series we have today. Edit: I suspect the Unversed-related changes left the biggest scars, and finding the original intent to them might heal those gaping issues, such as the Mirror claimed by the journal to be and Unversed, and just how darn strange and contradictory the Unversed seem to be in the midst of the story. I really don't get what's so unusual or "weird" about Aqua's behaviour there when taking into account how Ventus first came to them and what happened whenever his past was brought up. He was a traumatized wreck when first coming there and it took the four years between his arrival and the actual beginning of BBS proper for Aqua, Terra and Eraqus to heal Ven's heart and bring him back to a stable state, Terra even implies this when talking with Xehanort, so it is sort of obvious that Aqua was "lying" because of the sort of overprotectiveness both her and Terra developed towards Ven (as mentioned in the reports section) and making completely sure to not cause any repercussion. Ah, thanks, that is very strange! I get this, but I'd personally have rather seen Terra lie at this early, introduction-to-the-characters stage, myself. I see, well, just out of curiosity: Why? To preserve a more "pure"/honest image of Aqua? Although it may not be presented very well (as are many things throughout BBS in all honesty), both Aqua and Terra having a sort of overprotective streak towards Ventus is supposed to be a thing. I actually think that the game implying Aqua is more of a "caring-liar" and Terra seems to be more a straight-forward person makes it more interesting to me, because that's like the opposite of what their stories are supposed to present them as, and it was at least a try to show us that there's more to them than we see. I'd also say that Aqua is honestly presented as too "pure" already. She's a kind-hearted, good person, but not the embodiment of perfection like I feel people often display her. Most of my criticism on this point comes from the way the authors seem to be trying to introduce their three characters very quickly and efficiently, and I feel the line fails them in that regard. Here's the problem with Aqua lying to protect Ven: the player can't know she's lying to protect Ven at this stage in the game! You don't learn about Ven's breakdowns until Terra gets to the Badlands, which could be ages from now if you play Terra last! So we can't see Aqua lying as a quick and efficient means of implying her protection of Ven, as it's more long-term if it's anything. Unfortunately, you can learn that Aqua's lying well before you learn why she's lying: Ven-first players can work out that Ven was dropped off with Eraqus as soon as they get the Letter from Xehanort at the end of the prologue. I know that I did. At this point, Ven players discover that Aqua is a liar, because they've only known her for a few minutes and her lying is one of the only things they've seen her do. That is her characterization to that Ven-first player! And I don't feel that's fair to her character. Aqua doesn't lie at any other point in the game, not even to protect Ven. In fact she's so foolishly incapable of lying that it's partially responsible for the spat at Radiant Garden that keeps Ven from going home to protection in the first place! Aqua is such a goodie-goodie that obeying the rules is both her classic Heroic Flaw and Idiot Ball specialty the same way that Terra's flaw is Obedience to Authority. I feel like introducing her on a lie, no matter what lie, is teaching Ven-first players the exact wrong thing about Aqua's big character fault. I also think there's a tiny bonus in having Terra deliver the lie. Let's say you're a Ven-first player, like we're pretending we are for the Retrospective, and it was Terra who lied. You get the Letter from Xehanort and learn Terra was lying just a few minutes later. How do you react? I think there are three ways. You could make a guess and presume that Terra's trying to protect Ven, you could presume that he was simply too young to remember at the time (at least until the game proves you wrong) or you could presume that he's Up to Something. And that's the hidden bonus: a Ven-first player is supposed to be suspicious of Terra! The lie would have become another piece of evidence in the pile. And I think that would have been pretty smooth. Pretty much my thoughts. I can't believe Aqua lying is meant to be the intended reading when literally it's her one and only lie in the entire series. Even more so it doesn't make sense because it's not something Ventus, if he was a real person, would ever believe because....well unless he thinks Aqua is his mother and Terra or Eraqus are his father then he has to know he comes from somewhere else. Little teenage boys do not simply pop into existence from the ether and Ven is intelligent enough to know that. It would of been a much more logical thing if Aqua had acknowledged the possibility that Ven was remembering something from his lost past. OR if she had hurriedly tried to redirect the conversation to something entirely different like if SHE was the one to respond with something like "Hey Ven have you ever thought of where stars come from" or something then it would work better. As it stands Aqua randomly lies this one single time, it's never once addressed again, and it's a lie that in no way would Ventus be able to believe. The only other way to make this work is if they had some sort of explicit scene showing Eraqus forbidding it or something else to indicate what the heck was with this one completely out of place line. The dialogue is certainly not very well written in this regard, but you can come to that interpretation quite easily once you play a bit further. They certainly do introduce them "quickly", but the "efficiently" is absent in its entirety. It is the main problem of BBS that they rushed the whole issue with the TAV trio and made more telling through reports and later (sparse) flashbacks than actual showing in regards of their supposed close-knit relationship. BBS would really have benefitted from something similar to the "Destiny Islands part" of KH 1, maybe starting the story actually one or two weeks before the night of the exam and have an actual mission/short story arc in Land of Departure itself. It's almost as if too much of BBS' actual fleshing-out story landed on the cutting room floor, leaving out too many parts that could truly enrich it and instead focusing solely on Xehanort's "Master plan" and making visual parallels to the other games. The question is though if it is really such a bad thing that the player doesn't learn the reason yet, as the game description before you get to the character selection screen clearly states that one can only see the full scope of the story when playing all three characters? If you play Aqua before Terra you also get the flasback with comatose Ventus where she sits at his bedside watching over him way before you get to know the reason why he fell into this coma (the flashback with Terra accidentally "overloading" the kid with a question barrage is also in Terra's story). The audience gets to see already during the proper Prologue that there is something "wrong" with Ven when they show him on Destiny Islands and the damaged heart station with nearly one quarter missing where he himself states that his heart is "fractured"/injured, so assuming that Aqua's behaviour might have something to do with this fact is not exactly a quantum leap. The Prologue is also not really about already teaching players about things but to raise impressions, impressions that can and will change once one plays more than one character. If there is already such a problem with just one line from Aqua, there will be many more to pop up over the course of the whole game due to its admittedly not very narrative-friendly structure. Yea, IF you play Terra last but you're not supposed to do that. Terra is meant to be played first, the scenarios for each character were written with Terra's coming first in production, that's also why he's the first in the list on the character selection screen and in Theatermode, so saying that someone who plays another character first is supposed to feel towards a certain direction regarding another character is a bit thin I think. The developers certainly didn't had that in mind when developing the storyline as otherwise there would be no need for a recommended order of play. Even not counting that though, the Prologue does not only consist of Aqua lying but also clearly shows off that she cares for him in her other lines directed towards him. If a Ven-player only takes away from the Prologue that "Aqua is a liar" and completely disregards the other stuff like her suggesting he take a blanket with him when doozing off outside, affectionally ruffling his hair and the whole Wayfinder-issue I'd say he or she didn't pay enough attention. I agree on this "tiny bonus" bit in that it would have certainly made for an interesting different take on things, but for it to work the intended order of the story (and its development itself) would have to start with Ventus instead of Terra, which it doesn't. You speak about "making up scenarios" yet you do exactly the same here with constructing stuff of why Ventus wouldn't be able to believe Aqua in any possible case. He obviously does and considering he has only four years worth of memories at all and likely also knows that trying to recall stuff from before causes pain it is not surprising he swallows it like that. You completely forget that Ventus is actually a trauma-victim in any possible case and you do not risk a backlash by bringing up things that are responsible for said trauma in the first place. Had Aqua acknowledged the possibility of it being "something from his lost past" or hastily changed the subject it would raise suspicion and could have led to Ventus becoming curious and investigative, something no one at Land of Departure actually wants, or even worse, cause another breakdown if it triggers something. By casually (and warmly, I might add) waving it away as a dream/nothing to worry about she managed to smoothly settle the issue without attracting any danger. Is the actual wording good or sensible? Hell no, but that counts for several parts of BBS where the dialogue itself is cringeworthy. You don't need an "explicit" scene of Eraqus forbidding it to make it work as you can take it out of the context when playing on. In the flashback scene during Ventus' arrival Eraqus clearly states that "Ventus cannot tell you anything because he doesn't remember anything. ", it is not rocket science to deduce that Terra and Aqua would obviously ask their Master for more information afterwards and Eraqus would instruct them how to handle Ventus once he awakens from his coma so it (hopefully) doesn't happen again. That's exactly what I mean when I say "everything delivered on a silver platter", you don't need to have everything spoon-fed to you in order to make sense of things. BBS is certainly missing several things that could enrich the setting better and especially go deeper on the TAV trio both as individuals and in their relationship, but this case is not one of them. You're supposed to make sense of some things in parts for yourself and make your own interpretations, quoting Nomura himself here. Being creative and "making up scenarios" is intentional. Just saying it doesn't make any sense context-, story-, and character-wise and let it be that is just the easy way out. There was no "critical information" for both Aqua and Terra to hide from Ven because they didn't know anything beyond the fact of the memory loss and whatever Eraqus filled them in on the trauma/heart injury (who himself only knows whatever lie-filled excuse Xehanort told him). By the time Terra learns more in the form of Xehanort's white-washed version they're all already in the midst of their journeys and it is directly before the great falling out at Radiant Garden. Terra afterwards not mentioning anything might be "out of character" at first glance, but it really isn't as in regards to Ventus it is yet again the same with not wanting to burden him with anything as in Terra's eyes he's on a quest given by Master Xehanort to eliminate Vanitas anyways so why needlessly cause Ventus worries? He also does insist on him going home with Aqua. With Aqua it is because he doesn't really trust her anymore believing she's spying on him and both she and Eraqus do not trust him anymore. Xehanort revealing a white-washed version of the reasons for Ven's breakdowns and trauma had exactly one purpose and that was Xehanort "keeping up appearances" in his own words and start to gain Terra's trust by playing a remorseful old man who made a horrible error, most likely the same story he also brought up to Eraqus when first bringing Ven to LoD, so I doubt that this was some late-development time extra addition to the storyline. On the contrary, when looking at the whole package I firmly believe that too much was cut out from BBS in the end rather than added. I'm guessing if you get wound up over even the slightest criticism of the games or "disobedience" of Nomura/SE's authority (i.e. what order to play the characters), you maybe shouldn't read this retrospective. Just a thought.